Nestled in a 700-acre cypress and pine forest located between the Magic Kingdom and Epcot, sits Disney's Fort Wilderness Resort and Campground. 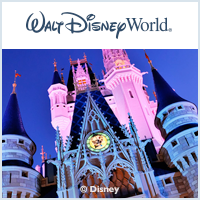 This Disney resort offers the best of the outdoors as well as one-bedroom cabins for those preferring the “great indoors.” There are 784 campsites ranging in length from 25' to 65' to accommodate tents, tent trailers and recreational vehicles. For those who prefer the comforts of home, there are Wilderness Cabins. These cozy, freestanding cabins are reminiscent of the old pioneer log homes. As you might expect, there is a lot of wildlife to be seen here. Rabbits, ducks, geese, deer, armadillos, and peacocks roam the grounds. The Settlement Recreation Area is on Bay Lake and includes the marina, beach, Pioneer Hall and the Tri-Circle-D Ranch. The Settlement Trading Post sells gifts, sundries, groceries, snacks and beverages. The Meadows Recreation Area is in the center of the resort. This area includes the Bike Barn (for rentals) and the Fort Wilderness waterways and bicycle trails. Swimming, tennis, volleyball and shuffleboard are all available at the Meadows Recreation complex. The Meadows Trading Post offers basically the same as the Settlement Trading Post, but also includes a deli.